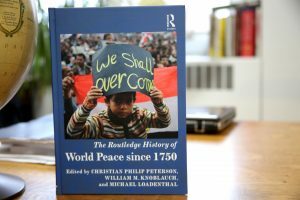 Finlandia University Associate Professor of History Dr. William Knoblauch latest publication, The Routledge History of World Peace since 1750, is available now. By design, the book combines the writings of multiple disciplines who historically don’t get along into one volume. Contributions range from authors working in fields as diverse as history, philosophy, literature, art, sociology and peace studies. The hope being to create a dialogue between these diverse disciplines about the topic of peace. Knoblauch, who was honored as the Board of Trustees Distinguished Faculty in 2018, will also have an article in the book Media and the Cold War in the 1980s: Between Star Wars and Glasnost (Palgrave Studies in the History of the Media) which should be published around December or January. Knoblauch’s first book was released in May 2017. The Routledge History of World Peace Since 1750 is available per request at the North Wind Books or can be found at the Maki Library.